Brian DePalma filmed in my apartment? In 2011 I watched a movie on cable TV called Sisters. 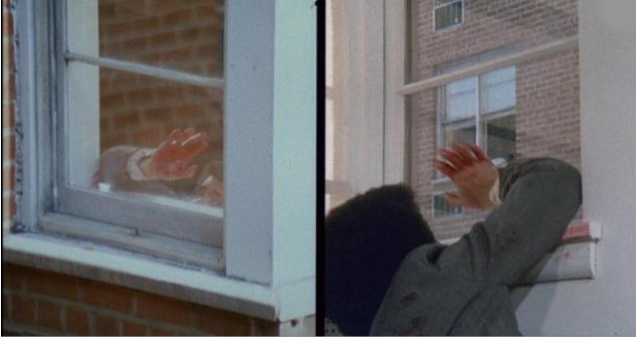 It’s a very early (1973) Brian DePalma thriller/murder-mystery about a local Staten Island journalist (played by Jennifer Salt) who sees a murder from her apartment window—my apartment window! Well, my apartment window or the window of one of the other five apartments directly above or below me. What a strange experience to watch an actress (in my living room) look out a window (in my living room) while I’m sitting in said living room. I couldn’t believe my eyes, so I kept watching for clues to location. Was it really my apartment? Soon enough I see the actress leave through the front door of my apartment building and get into her car on my street. Margot Kidder stars, playing two roles—mentally unstable Siamese twins, identical in appearance but different in crucial ways. The film’s storyline is apt. In viewing it, I experienced a destablizing twin experience of my own! There’s the obvious doubling of experienced space—but there’s also the doubling of experienced time—past vs. present time; filmed vs. actual time. Time and space blurred and refocused constantly as I watched the movie. Though the apartment and building I live in still looks remarkably the same as it did in 1973, the film’s texture and coloration signal a different era. Add to that the outdated hairstyles, clothing and cars—and the decades-younger faces of now mature actors—and you’ve got a viewing experience with dizzying layers of time-space discontinuum. A movie can feel like real life—and reality can feel like a movie. Experiencing both at the same time is a voyeuristic mind trip that Brian DePalma would truly appreciate!